March 30, 2015 – The team operating NASA’s Mars Exploration Rover Opportunity learned Thursday, March 26, that the long-lived rover experienced a brief amnesia event related to its flash memory, the first since a reformatting of that nonvolatile type of memory a week earlier. 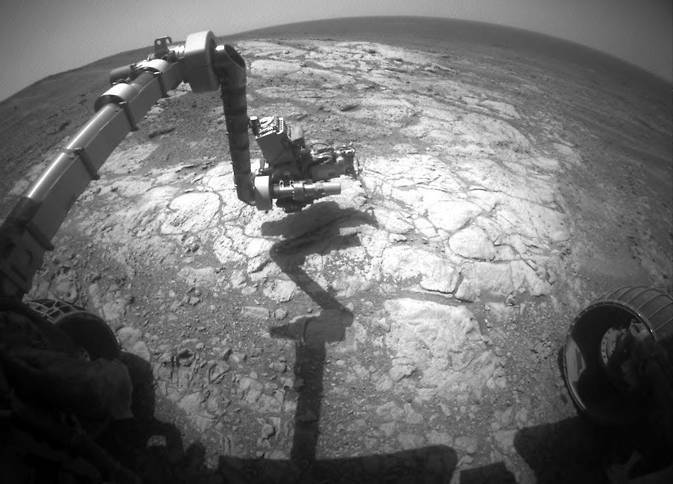 The amnesia event did not result in any loss of science data, and Opportunity subsequently continued its activities using tools on its robotic arm to examine a rock target called “Athens.” The rover experienced dozens of similar amnesia events and more serious flash-related resets of the onboard computer prior to 2015, then operated without using flash memory until last week. Opportunity has seven banks of flash memory. This month, the team revised the rover’s onboard software to avoid use of Bank 7, where some of the earlier problems with flash memory had been traced. After the March 20 reformatting, the rover resumed use of the other six banks. No root cause for the full combination of flash problems has been determined, since many of the past problems with flash could not be traced to a specific bank. Last week, Opportunity became the first vehicle ever to travel the distance of a marathon race on the surface of another world. The rover is examining outcrops on the western rim of Endeavour Crater, approaching “Marathon Valley,” where clay minerals have been detected in observations by NASA’s Mars Reconnaissance Orbiter. NASA’s Mars Exploration Rover Project landed twin rovers Spirit and Opportunity on Mars in early 2004 to begin missions planned to last only three months. Both rovers far exceeded those original plans. Spirit worked for six years, and Opportunity is still active. Findings about ancient wet environments on Mars have come from both rovers. The project is one element of NASA’s ongoing and future Mars missions preparing for a human mission to the planet in the 2030s. NASA’s Jet Propulsion Laboratory, a division of the California Institute of Technology in Pasadena, built and operates Opportunity and manages the Mars Exploration Rover Project and the Mars Reconnaissance Orbiter for the NASA Science Mission Directorate, Washington. The University of Arizona, Tucson, operates the HiRISE camera on Opportunity, which was built by Ball Aerospace & Technologies Corp. of Boulder, Colorado.